ONLY ACCOMMODATION NOW AVAILABLE – REGISTRATIONS FOR RIDE EVENT IS NOW FULL! Strade Bianche is now establishing itself as a major classic, why not join us for an unmissable weekend in the heart of Chianti in Tuscany. 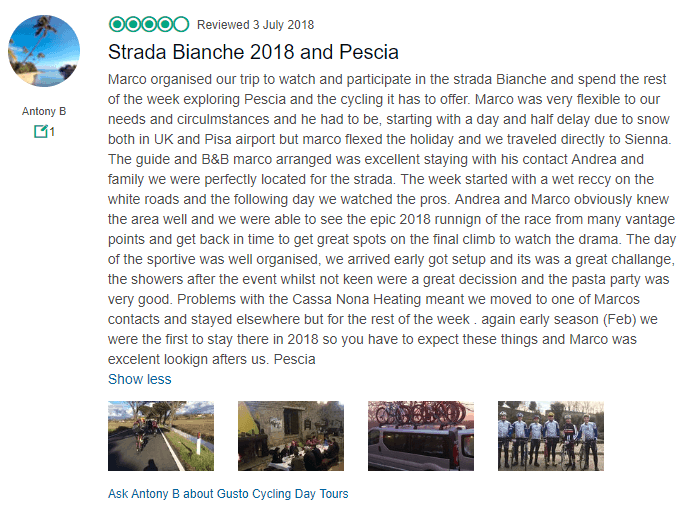 Gusto Cycling are offering 2 type of packages of 3 night/4 day package – Basic package is a stay in Siena for the whole weekend or enjoy a Guided weekend based in my friends farmhouse 12km outside Siena. ONLY ACCOMMODATION NOW AVAILABLE – REGISTRATIONS FOR RIDE EVENT IS NOW FULL! Friday depending at what time you arrive you can enjoy a cycle ride on some of the routes of the event and test yourself by climbing the final hilly section into the centre of Siena, i can assure you it’s good to test yourself on this last hilly section, remember what happened to Wout van Aert who came in 3rd place he had a real struggle to get over this section. Saturday – Professional Strade Bianche pro race starts in Siena, watch the riders sign on, then watch the start and later wait to see them arrive back into Siena and finish in the famous Piazza del Campo in the heart of Siena. Cost for the above £369 per person based on 2 persons sharing (limited places at this price) a twin/double at the 3star hotel and ride registration, the hotel is located near Siena train station and perfectly located near the start / finish of the ride event. Once checked in at the accommodation, we head straight out and cycle parts of the Strade Bianchi and probably meet some of the pro’s along the route who will be doing a reccy of the ride for the following days pro race, after we head straight to the Centre of Siena up the iconic climb into the main piazza del campo where the famous race ends. Saturday night optional dinner at local restaurant. 10 March Sunday – very early breakfast – we transfer to Siena, park up and head to start line. * Sunday return Transfer to Siena central to participate in the Gran Fondo Strade Bianche ride event. Bike Rental available in case you don’t fancy bringing your own bike – limited numbers – tyres will be 25mm!! Saturday – Watch the Pros at the start – 2 transfers to watch the pro’s s along the route and return to watch the pros return to the finish. Ride the famed white roads in Tuscany. Sunday – Participate in the famed Grand Fondo Strade Bianche. Enjoy 2 dinners with local family and friends. 2 evening meals with wine and water. To participate in the Gran Fondo Strade Bianche, you must be aged between 18 and 64. Alternatively 16-18 and those over 64 can enter the Medio Fondo Strade Bianche. The certificate needs to state that you according to clinical investigations carried out, doesn’t present any contraindication related to sport to cardiovascular intensive activity.